Any materials that go home with a student will be charged at our cost. In the several classes where every student works on his/her own project, we have noted the usual material costs in the course description. Material prices include tax where applicable. You will be sent a list of the hand tools you will need for your course as specified by the instructor, as well as suggested preparatory reading. 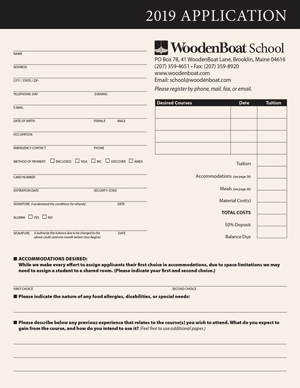 Winners of boat raffles will be responsible for paying material costs before leaving Brooklin.